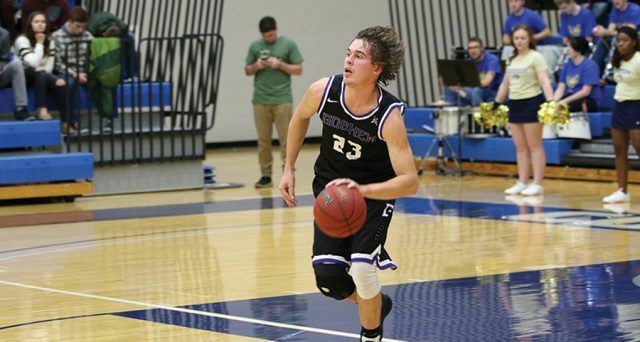 Logan Primerano, a junior, made his Goshen College debut on Saturday afternoon and punched in a team-high 14 points in just one half of play as the Goshen College men’s basketball team fell in defeat against the no. 1 ranked Cornerstone University Golden Eagles 97-67 at Mol Arena. Primerano missed Goshen’s first five games of the season due to injury and checked into Saturdays game at the start of the second half to register on 5-of-11 shots from the field to go along with three gimme’s from the charity stripe. The NCAA Division I transfer from the University of Massachusetts-Lowell also added a pair of rebounds and assists to pencil in the remainder of his first ever GC stat-line. The Golden Eagles struck first and jumped out to a quick nine-point advantage to open the ballgame, but the resilient Maple Leafs fired right back by knocking down seven of their first 10 shots to bring the score back to a 16-15 ballgame in favor of Cornerstone midway through the first frame. The small slump was short-lived as the Golden Eagles shot 20-for-30 (66.67 percent) the remainder of the half from the floor and went into the break leading 57-33. First-year Patryck Ostrowski led the way in the first half for the Leafs scoring all of his eight total points in the first 20 minutes while Grider contributed seven. Shooting for both sides fell in the second half as Goshen shot 13-39 (33.33 percent) to Cornerstone’s 12-28 (42.86 percent) mark. Senior Christian Grider finished the 40-minute affair as the only other Leaf in double-figures with 11. Conner Funkhouser, a senior, added eight. Goshen’s season-leading scorer, senior Billy Geschke, was absent from the heavy weight matchup as he continues to recover from an ankle injury suffered in GC’s previous game against Rio Grande University. Senior big-man and Southern Indiana University transfer Emmanual Audu led Goshen with seven rebounds and had a game-high three blocks. Tanner Camp, a sophomore, also contributed a stuff. Following their rescheduled matchup with Ohio Christian University on Wednesday (finished before print deadline), the Leafs travel back to Grand Rapids, Michigan on Saturday to square off with Davenport University. Tip-off is set for 3 p.m.